100% natural coconut husk fiber growing medium. Available in a range of sizes, see pack size drop down opposite for details. Coco fiber is a must for composting because it greatly improves decomposition and prevents the leaching of valuable compost nutrients. Add coco fiber every time you add green matter to your compost pile or bin. Coco fiber is perfect for use in kitchen compost pails to eliminate odor at the source by absorbing excess liquid. Add a layer of coco fiber every time you add food scraps to your kitchen compost pail. Coco fiber will continue to work in the compost bin after being transferred from the kitchen compost pail and also in the finished compost. Coco fiber's ability to maintain a balanced micro-climate makes it the perfect choice for bedding in worm composting. Coco Garden compresses its coco fiber into a convenient light weight package that expands several times its size when placed in water. Coco Garden coco fiber is a 100% natural eco-friendly alternative to peat based potting mixes. Peat moss is extracted from peat bogs that take thousands of years to form and years to recover and therefore is not a renewable resource. 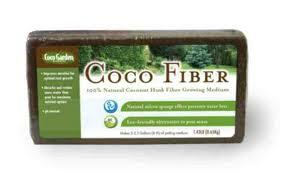 Coco Garden coco fiber is a completely renewable resource made from 100% natural recycled fibers of the coconut husk. Coco fiber's micro sponge effect dramatically increases the water retention of soil and improves aeration, ensuring optimal root growth and maximum water and nutrient uptake for lawn grasses and container and garden plants. Use anytime you have a need for a potting medium. Coco fiber is excellent for use as a seed starter, planting seedlings and transferring plants. Can be added to dry soil conditions to improve water retention and also for soils high in clay to improve aeration and root growth. When compared to conventional potting mixes compressed coco fiber lasts longer, requires significantly less packaging material and has a lower shipping weight and volume which greatly reduces its impact on the planet. Coco Fiber in Composters: It's always best to expand the coco fiber and dry it out before use in the composters. But generally it's ok to expand the coco fiber and add immediately to large composters because they tend to dry out faster (due to the higher temperatures) and the added moisture in coco fiber could be beneficial to the compost mix. A 1:3 ratio of coco fiber to green matter is a good rule of thumb but it really depends on the types of green matter being added. So the user needs to balance the mix based on his needs. Again how you use the coco fiber can depend on need and convenience so some may want to simply add a compressed brick or disc directly to the bin. The decision to decompress and dry out simply depends on whether the user has time or more importantly is whether they need an immediate effect. For example if their compost is starting to smell then dry expanded coco fiber will rapidly solve their odor issue. If the compost is well balanced and without significant odor then they can get away with adding the compressed form directly or even the expanded wet form immediately after expansion. One 1.43-Pound (650-Gram) brick makes 2-2.5-Gallon (8-9l) of potting medium.